22nd & Philly: City Dining Cards Giveaway! Eat more! Save money! 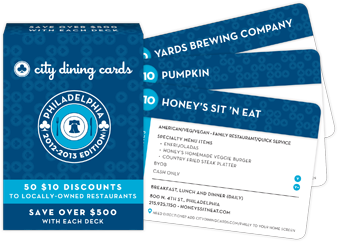 City Dining Cards sent us two packs of discount cards to some of Philadelphia's top eating establishments and we're giving them away to you, our readers. Each pack includes 50 discount cards worth $10 each to local spots like Pumpkin, La Calaca Feliz, Honey's Sit 'n Eat, and more. If you like what you get, tell your friends or buy more packs as gifts. They are only $20 and 5% of all sales goes to local food banks. It's like those Entertainment books, but for restaurants only. How do you win? Simple: Just type your email address in the box below and you'll be entered. You’ll automatically be subscribed to 22nd & Philly's posts and get a heads up on future giveaways, but we promise we don't spam or sell your email to anyone else. Two winners will be selected at random and notified next week. If you're a current subscriber, you're already entered to win, too. Notes from the fine print: A $30 minimum purchase is required to use City Dining Cards and the discount only applies to food, not drinks. Dine in only. The cards expire 12/31/13. See more details here. Enter to win City Dining Cards!